Stock photo looking up the trunk of a western redcedar tree (western red cedar), Thuja plicata, toward the sky high above along the Rainforest Trail in Pacific Rim National Park on the west coast of Vancouver Island, British Columbia, Canada. 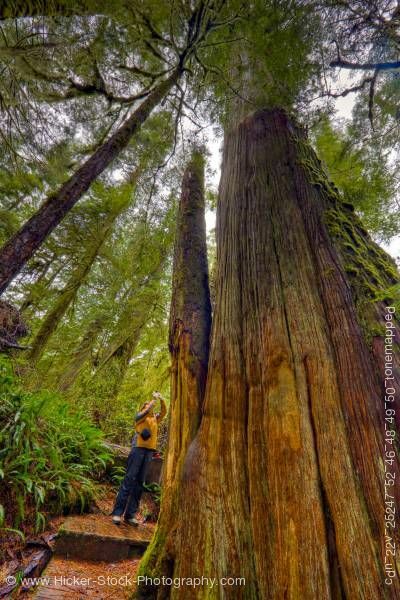 This stock photo shows mainly one giant western redcedar tree (western red cedar), Thuja plicata, along the Rainforest Trail in the coastal rainforest of Pacific Rim National Park, Long Beach Unit, Clayoquot Sound UNESCO Biosphere Reserve, West Coast, Vancouver Island, British Columbia, Canada. There are others all around and their branches canopy the sky, but most of this scene is occupied by the trunk of one huge tree looking up toward the sky. Western red cedar (Thuja plicata), also Western redcedar, is a species of Thuja, an evergreen coniferous tree in the cypress family Cupressaceae. In the American horticultural trade, it is also known as the Giant Arborvitae, Arborvitae being another name for its genus. Western red cedar is the Provincial tree of British Columbia, and has extensive applications for the indigenous First Nations of the Pacific Northwest.